At Windows, Walls & More here in West Bloomfield, we’re excited when we can offer savings on top of the value already inherent to Hunter Douglas products. That’s why we’re pleased to announce the Celebration of Light Savings Event, going on now through June 25. During this event, you can get rebates of up to $100 on two premier products from Hunter Douglas: Luminette® Privacy Sheers and Silhouette® Window Shadings. These light-diffusing window treatments let you design with soft light while providing privacy at the same time. Speak with one of our consultants for full details on how you can earn a rebate today. With Luminette Privacy Sheers, you get the look of traditional sheer draperies with the ability to rotate the vertical fabric vanes like a traditional vertical blind. The Luminette vanes rotate to provide 180° of light control and are available in both translucent and room-darkening fabrics. They’re great for walls of glass, sliding doors, French doors, and wide window expanses. Silhouette window shadings transform sunlight into remarkable beauty. They’re available in a wide range of beautiful fabrics, including casual linen, woven and light-dimming materials. 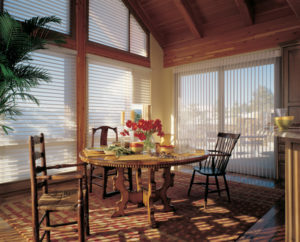 Both window fashions offer UV protection, style, and beauty at the window. You’ve got to see them to believe them! Hunter Douglas offers numerous operating systems to choose from. 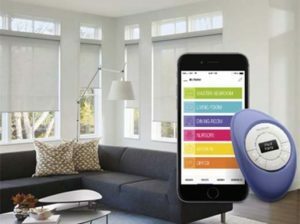 Among them, the gold standard is PowerView® Motorization. With PowerView, you can operate and program your shades to open and close when you want—even when you aren’t home. Use the PowerView app or the PowerView® Pebble® (a modern take on the remote control that has incredible range) to control your system. No longer for just convenience, PowerView opens a whole new world of functionality, privacy, and safety for your home.